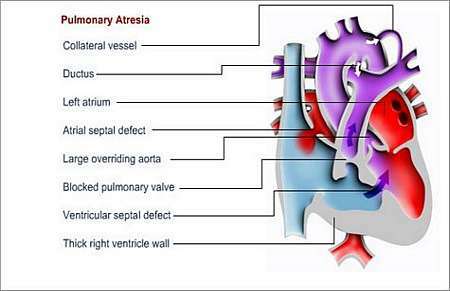 Pulmonary atresia is characterised by complete blockage (valve is either absent or there is no opening) between the heart and the main pulmonary artery (the artery that takes blood to the lungs). The pulmonary valve allows blood-flow from the right ventricle (lower right chamber) to the lungs; in pulmonary atresia this valve has not formed or may be completely closed. Many people who have pulmonary atresia also have a ventricular septal defect (a hole between the two lower chambers of the heart - the left and right ventricles). The right ventricle may also be very small and some extra vessels called collateral vessels, which go directly to different parts of the lungs from the aorta, may be present. Blood can only, due to complete blockage, reach the lungs from the aorta via the ductus arteriosus and collateral vessels. In a foetus, the ductus arteriosus forms a passageway that connects the pulmonary artery to the aorta. After birth, there is natural closure of the ductus arteriosus, which means that the only path for blood to the lungs of a newborn baby with pulmonary atresia will start closing soon after birth. Oxygen-poor blood travels directly from the upper-right chamber (the right atrium), via a small right ventricle, to the left side of the heart, instead of following the normal route to the right ventricle (lower heart chamber) via the pulmonary artery to the lungs. Oxygen-poor blood is then pumped back into the body. As a result, the patient appears cyanotic (blue-grey discoloration of skin due to a lack of oxygen-rich blood, especially seen on the toes, fingers and lips). 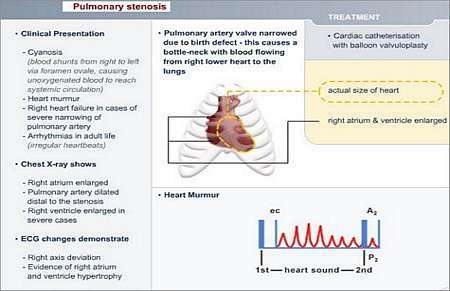 The treatment depends on the size of the pulmonary artery and the number of collateral vessels. Newborn babies with pulmonary atresia are usually given medication that keeps the ductus arteriosus open after birth. The type of operation determined will depend on the size of the right ventricle and pulmonary arteries. If the size of the right ventricle is acceptable and the right ventricle pumps blood, the flow of blood can be normalised through the heart by means of open-heart surgery. This operation is only palliative (it does not cure the condition, but prolongs life) and is performed to increase the amount of blood that is transferred to the lungs. Some of the blood that normally goes to the arm gets diverted to the lungs. In patients with acceptable size pulmonary arteries, the right ventricle may be joined to the pulmonary artery with either a patch or a tube. In patients with excessively small pulmonary arteries, several shunt operations may be necessary. Collateral vessels may be joined to form a single blood-supply to each lung; this is called unifocalisation. At a later stage, these vessels may be joined to the right ventricle. This procedure is performed in cases where the right ventricle is too small and not functional as a pump. The right atrium is connected directly to the pulmonary artery. 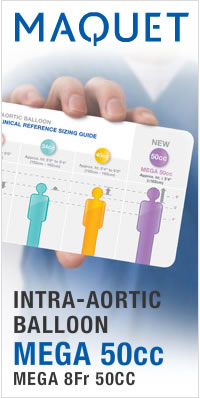 Used as an alternative procedure, this operation is performed to connect both the superior vena cava and the inferior vena cava to the pulmonary artery. This implies that the child has a univentricular heart i.e. a heart with only one pump chamber. This is a very complicated condition, and treatment is individualised. In certain cases where collateral vessels carry too much blood to the lungs, it may become blocked during a catheter procedure or get tied off during an operation. The patient has to visit a cardiologist regularly for future follow-up. The patient will have to take measures to prevent endocarditis for the rest of his or her life. Endocarditis is an infection of the inside lining of the heart or heart valves.